15/19: The interior is being completely updated,. New photos shortly. 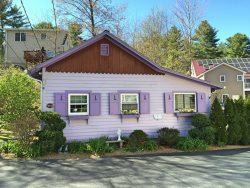 *NOTE: The "Total Price" in the Instant Quote box includes your REFUNDABLE security deposit of $900, the 9% Maine State Lodging Tax, and other applicable fees. Sleeps 6 - 3 bedrooms, 3 bathrooms- OCEAN at your door step! Exceptional York, Maine vacation retreat in the exclusive coastal Cape Neddick shoreline. Sweeping water views with the sound of crashing waves and ocean breezes are the highlights of this upscale family home located in the private Seaside community on Cragmere Way. Renovations to be complete for April photos. I can only say that the transformation is worth the wait. Comfort and style! This home offers the appeal of solitude, the hypnotic rhythm of the waves, the visual stimulation for creative endeavors, or the where with all to relax from the stresses of your hectic schedule. Clean and bright throughout, you fill enjoy the water views from most every room. The Central A/C is available for those who find it most comfortable. Linens, Towels are included for our guests as well as quilts, comforters and pillow shams. Bath mats also provided freshly laundered for each guest. The Main floor features the kitchen and large great room with two seating areas and a half bathroom. Enjoy preparing meals in the bright kitchen with views of the water and The kitchen is fully stocked with plates, glasses, flatware, serving utensils, and pots and pans (including a large lobster pot). Appliances include a traditional coffee maker, Keurig coffee maker, toaster oven, blender and more. Kitchen appliances include: electric stove, dishwasher, and refrigerator. The Great room, also on the main floor offers an enormous TV complete with Cable services and WiFi throughout. Step onto the large upper deck off the great room. Take in sweeping ocean views to the east where you can enjoy amazing sunrises and views to the west to watch the deep orange sunsets. Outside seating, Gas Grill for outdoor cooking, lower patio off the third bedroom with seating. Lounge chairs for sunning just beyond on a special at the lower ocean side patio area. The Master suite is located on the main floor and offers a King sized bed, an en suite bathroom which offers a soaking tub as well as a shower. This room has Flat screen Tv, cable, Wifi as well. The second bedroom, also on the main floor is equipped with a Queen Sized bed, Tv with cable and WiFi, and a private bath with shower. The third bedroom occupies the lower level, is equipped with a Queen sized bed, Tv with cable and WiFi, and a private bath with shower. Amenities nearby: It is near the Cape Neddick Country Club, an 18-hole golf course open to the public, a five minute drive to the community of Ogunquit it's artists galleries, quaint shops, the infamous Ogunquit Playhouse, fine dining, and soft sand beaches, the renowned Cliff House Resort and Spa, 5 to 10 minutes to York with it's museums, shops, and soft sand beaches. Need more Portsmouth, NH or Portland, ME, or Freeport ME are a day trip adventure! Bed Linens, Pillows, quilts, blankets, and bath towels are included.